Na-na-na-na-na-na-na-na- BATMAN!!! Or at least something like that. Polar Lights has decided to take advantage of the craze for Batty stuff and has released two new kits based on the comic books. Guess that doing the TV Batmobile would have cost too much for licensing fees. 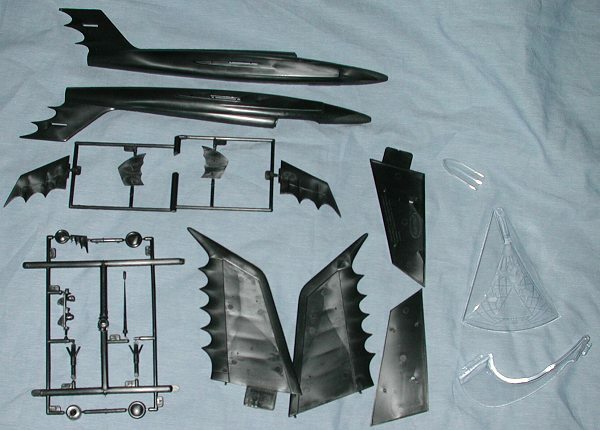 What we have here is a new mold kit (correct me if I'm wrong) as it is dated 2002. Were it an old Aurora mold, I'm sure they'd have used the Aurora logo on the box. It is also of the very cool Batplane. As it should be (to have room for Robin) it is a two seater. It also has the requisite scalloped trailing edges of all the flight surfaces and looks very much like a 1950s jet. In the usual thick box that is now a bit of a trademark of kits from the PRC, this one has two cellophane bags inside; one containing the black bits and the other with the clear pieces. A really nice inclusion is the old Aurora display stand, undoubtedly to help bulk things out and make the kit seem as if it is worth the $17.00 price tag. In reality, there are darn few parts to this kit. Less than two dozen parts, which is quite minimal by today's standards. Of course the bat plane is a fixed gear jet (quite rare in aviation circles), so there is no need for pesky details like wheel wells. Apparently atomic powered planes are like this......The interior consists of a blanking plate with a pair of heads on it (Batman and Robin, of course). The whole kit has a 50's feel about it in the way the parts are molded: huge sprues, minimal detail, very few parts, easy construction..... This continues to the instructions which are very much like Aurora ones with a single exploded view and a step by step written construction sequence. Of course, no color information is provided as everything is supposed to be black! The instructions state to "Read DIRECTIONS on the back of DECALS before you apply them." Well, there are none. 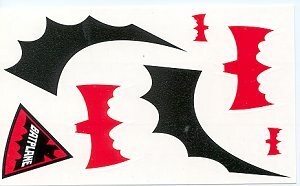 Just a sheet with a few red bats for the plane, a black curve and red triangle for the display stand. No directions. I assume that water is part of the deal..... All of this fits in very well with the overall nostalgic feel and is undoubtedly a selling point to the kit. If you have a kid at home who is ready for a glue kit, then this is perfect for him. If you want a kit that you won't have to obsess over details and colors, then this is perfect for you. It has to be the fun kit of the year.